She is a member of the New Hampshire and Massachusetts State Bars, the Elder Law, Estate Planning and Probate Sections of the New Hampshire Bar. She is also a member of the National Academy of Elder Law Attorneys and the Merrimack Valley Estate Planning Counsel. Other memberships include the New Hampshire Women’s Bar Association, the Lawrence Bar Association, New Hampshire Conflict Resolution Association and National Association of Consumer Bankruptcy Attorneys. 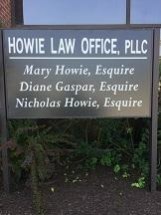 Attorney Howie also serves on the Board of Trustees at Holy Family Hospital in Methuen, Massachusetts and served on the Board of Directors for Salem Haven Nursing Home. She is very active in the Salem, New Hampshire community organizations.